It has been easy until recently to ignore the concept of mobile browsing as it did not impact a significant portion of the traffic on the internet. 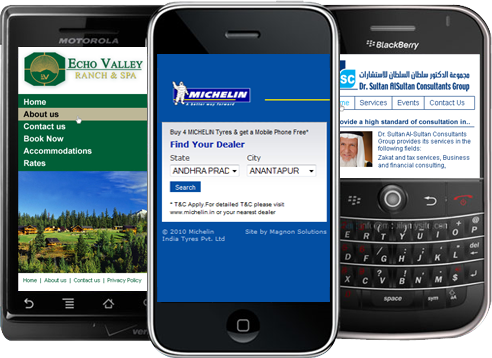 That notion has changed, however, with 2011 seeing a total of 20% of all web traffic coming through mobile phones. That is a huge jump and change from just a few years ago when phones barely could connect to a carrier’s online store to purchase ringtones and wallpaper. It is now vital for the success of your website to have a mobile-friendly version in place for anyone who discovers your site on their phone, especially if you are selling a product. While the process of creating a mobile version of your site is too complex to explain here, I will show you the basics of what needs to be done and where you can find more information on the subject. For the most experienced developers, using CSS as a platform for a mobile deployment may be a good idea. It all is going to depend on the type of site you are running and what functions you want to keep within the mobile browsing version of your site. Definitely the most professional way to develop a mobile version, CSS gives developers total control over the look, feel and function. It can, however, be quite a pain to use for anyone who is not well-versed in a series of programming languages so other options may be the best route if you are not an expert. For those of us who do not have the skill-set or the time to invest in developing our own separate mobile browsing version, there are a variety of online services that can get you heading in the right direction. The most popular service currently available is Mofuse, which offers self-service and customised designs depending on your budget. For drag and drop self-design, you can setup a mobile version for as little as £5 per month. There are also free alternatives such as Onbile, which have limited features and templates but still look great. ConvertWebsite is also an option; they completely customise everything for you and the process takes longer than most, but the results are great. If you are using content management systems like WordPress and Drupal, you may also want to try out some of the plug-ins that have been developed that create a mobile-friendly version of your website. I have used them on WordPress and depending on the style and function of the site, you can expect mixed results. Nevertheless, these plug-ins may work for you and you should try these if applicable before paying for any mobile version of your site. Some of the plug-ins and tools that are available include WPtouch, WordPress Mobile Edition, Wptap, and for Drupal there is the Mobile Plugin for Drupal as well as OSMOBI, which also works with Joomla. Finally, you will want to make sure that any version of a mobile site that you are using functions properly with any and all mobile browsers. One of the ways to do this without actually deploying it live is to use an emulator. I always use iBBDemo2, which shows you how the site looks on iOS (iPhone/iPad) and on Android SDK. There are other emulators out there that can also be used for compatibility with Windows Phone devices if you discover you have a large amount of traffic coming through that browser. Once you have ironed out all the kinks, your new mobile site will be ready to deploy and will start attracting more mobile users who will peruse your site instead of leaving it due to improper formatting. Mobile friendly web designs are super important in this day and age yet so is content – don’t alienate your customers by having a great design with poor web copy. If you need some help in this aspect contact Apple Copywriting and see how their copywriters can help you. I agree, it is very important to have a mobile-friendly website as users are now moving towards mobiles, tablets & ipads from the computers & laptops. Users are now surfing as when they get the time. So it has become really important to have a mobile website.